Well, I missed last Tuesday so I am not going to miss another one. Since I am too lazy to find a theme to make Theme Tuesday (a post I make on Tuesday with a certain theme), let me just post what I just ate for dinner, ok? You see, I don’t cook every day because my children sometimes do not fancy eating the same rice or pasta meals at home. I hate having leftovers to deal with. I like to dump all those edible food into the fridge and wait for Monday and Thursday when my housekeeper will take them to feed stray dogs. She would go around feeding stray dogs (strange huh?) and hence, these foods come in handy. But you know, some of the foods are awfully good and still edible. So, if they are still clean and untouched, I will packed them nicely and freeze for her to heat up and eat as their meals. Belacan fried chicken that my kids love. Three pieces for only RM5.90. Crispy, hot and fresh. Nice! The tomyam beehoon that I had tried eating three times but failed. Because the hawker only starts selling at 8 pm and on weekends, the business is so good, they couldn’t even be bothered to listen to my order! 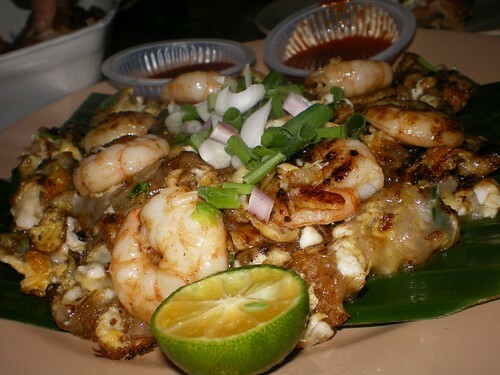 Sheeesh….Three prawns with lots of fish slices for only RM6. 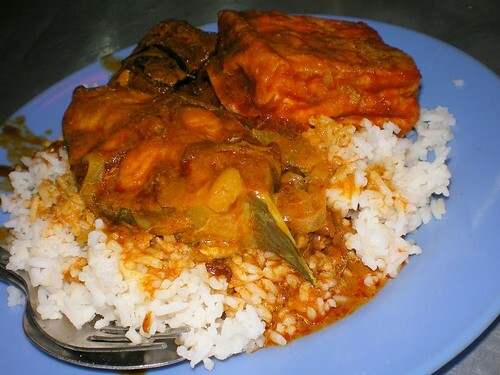 Catfish curry rice. I love, love, love catfish for it’s oily flesh and this Indian Muslim stall sell huge catfish. One piece of soyabean cake (taukua), one catfish and one piece of beef for only RM4. Normally, if my husband and I eat out, we go 50-50. I.e. I eat half and he eats half. Secret to our long marriage. Hahaha. We get the best of both worlds. I like the tomyam bee hon and prawn omelette, they make me mouth-watering now..hmm..must be nice. All from that Kedai Kopi Min Jiang? 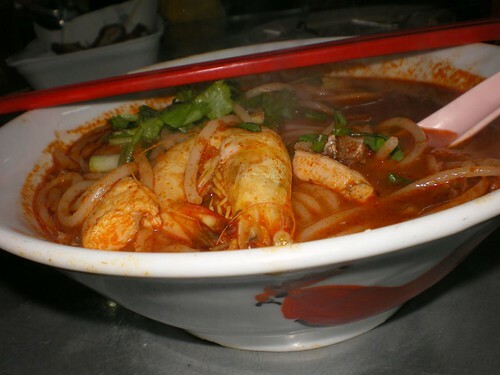 I love that Tomyam Bee Hoon, looks yummy. Wah so cheap lah. I think in Perth a bowl of noodles would normally cost around AU$8.00-9.00 each. We had 2 nasi campur for adult and 2 white rice and chicken for kiddies plus drink and it cost us $40.00. 50-50, Sooo lomantic. Our is 80-20. Thats why I am so fat now. Mmm… belacan fried chicken? That’s something new! my eyes cannot detach from the belacan fried chicken photo…. ISH! Where is this place? I waana eat too! nocturnale – It is in Penang, in Air Itam area. shanon C – Try it, the place has many good stuffs there. dad of four – Actually, it is very common here. terence – I know lah. KGC – Yeah, all from Min Jiang. Nice foods there lah. no & maria – I also feel hungry myself. the belacan fried chicken is absolutely tantalizing! what’s the name of the shop and where in air hitam?